Don’t feel bad for this troll, he offended the trash loa and must be punished. 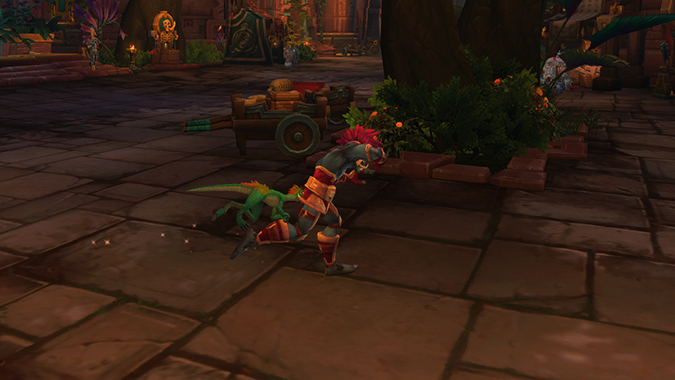 I also offended the trash loa, which is why I was the poor unfortunate soul chosen to take a chomp at troll tookus. The moral of the story here is maybe you shouldn’t offend the trash loa, which is only appropriate because Jani is the best. You know what else is great? Answering your questions. Let’s get to that. So im not sure if I recollect properly. And I’m sure its been brought up b4. But does anyone remember Logos for the Apple IIe? I think it was a program that had you direct a turtle around. So you sort made “Loh Go”? Im fairly certain Blizz dropped a reference to stuff I did 30+ years ago in grade school. Bravo! Blizz Bravo! That is exactly what that world quest is referring to — LOGO was a programming language, and it used turtle graphics to trace shapes and lines. You’d guide the turtle through a series of programmed coordinates and it would leave a line behind it in whatever design you were going for. Out of all the Tortollan world quests, I think this one is my favorite — although I sometimes wish it would switch up the puzzles. Even a half dozen or so random templates would be more interesting than the same map every time, you know? I’m thinking of trying to get the heirloom rings from the garrison shipyard. Is it worth the effort to get the shipyard going on more than one character or am I better off just focusing on one? I’d say just focus on one. The shipyard takes a while to get set up and functioning, and having to do it on more than one character seems like an excessive amount of effort for a 5% XP bonus, you know? Trying to do that on multiple characters just feels like you’re deliberately setting yourself up for a headache. Unless, of course, you’re super bored, in which case knock yourself out. But I’d say it’s probably not necessary. So for altaholics…. To avoid burn from leveling, how do you make it interesting? I have 1 of each class at 110 or above which helps with a different play style and mechanics which does change it up. I’m curious about the alts that have multiple of one class. I found that i can level 1 more of each class but I do it with a different specialization, I feel the change in general mechanics helps alot. For me, I just switch up how I level. I’ve leveled one Alliance Rogue, I’m working on a Horde Rogue right now, and the switch in storylines is keeping me happily occupied. If I want to level another Alliance or Horde character, I’ll probably switch up the order that I do the zones in. Or hey, maybe I’ll focus more on doing a lot of dungeons, or Island Expeditions, and less in the way of zone storylines. There’s a lot of different ways to hit 120 these days, and while it might not be as interesting as all the individual Class Hall storylines in Legion, there’s enough of a shift to keep things interesting. I will say that I never feel obligated to rush an alt to max level. If I start getting bored with a particular class, I’ll just stop leveling and hop to a different class for a while. Typically speaking though, I’ll take my time with leveling alts, and just switch to those when I’m in-between things to do on my main. I mean, Battle for Azeroth just came out, we’ve got a good year or better of content and patches to play through and keep ourselves occupied, there’s no need to rush, right? Has it been confirmed regarding the new Allied races in 8.1? Yes — or rather, no. It’s been confirmed that new Allied Races will not be out with the launch of patch 8.1. They’ll come out later on, either at some point after the patch has launched, or with the arrival of another patch. But hey, don’t let that news get you down — it’s also been confirmed that you won’t have to grind any additional new reputations to get them once they do arrive. Just work on getting your current reputations to Exalted and you should be all set once they do eventually drop. Hiya guys. Maybe weird question for everyone. How is the Horde BFA story? Until halfway through Legion, I’d never leveled a Horde alt past level 10. However, I wanted to see the Horde side of the story and learn about Paladin healing, so I leveled one up to 110. Now, for BfA, after capping 3 Alliance alts, I thought maybe it was time to turn to the darkside and switch to my Horde alt. Problem is, I really really dislike Paladins. I don’t find any of the specs enjoyable but I’d probably be willing to attempt patience if the Horde story was interesting/fun/enjoyable/etc. So — How is the Horde BfA story? Thank you in advance for any replies. It’s really good. Just as good as the Alliance side, and in some parts, better than the Alliance side. Of course, I really like Troll lore and stuff about the loa/Titans/Old Gods, so I might be just a teensy bit biased, but I’m having every bit as much fun leveling Horde side as I did on Alliance. I feel you on the Paladin front though — that’s one class that I just never really enjoyed playing. I mean, I was okay with it, I didn’t spend all my time dying or taking on more than I could handle, but it just wasn’t…fun. That’s not to say there’s anything wrong with the class, it’s just not my particular cup of tea. Different people have different preferences and all that. If you’re really concerned about it, maybe consider doing a boost of a different class, or transferring factions with one of your other alts. But honestly I’d say unless you really loathe playing a Paladin, the story should be enough to keep you entertained, even if the class isn’t necessarily what you’d really love to be playing. Q4tQ: Was there ever a character who was turned into an undead and loved it? Like woke up, said this was a huge improvement, shook the hand of the mortician and then went whistling on their way never to look back on a life alive? Like every day dead is a gift? Not to my knowledge — but I think the closest might be Lord Godfrey. He wasn’t exactly overjoyed with being raised from the dead, but he much preferred the fate he was handed over becoming a Worgen. He didn’t particularly care about Sylvanas or her plans, either, he was simply focused on reclaiming Gilneas for himself. That was really the crux of his focus in life — he wanted to save Gilneas, whatever the cost. Even if that included tossing Genn at the Forsaken to get them to leave. And in undeath, that was also his goal, although he approached it from a different direction. He might’ve succeeded, if Sylvanas didn’t have the Val’kyr to raise her from the dead again. So while he wasn’t super happy about being undead, he didn’t look at it like it was some sort of cursed existence or anything — for Godfrey, it was simply a bonus life, through which he could continue to try and obtain what he really wanted while he was still alive.